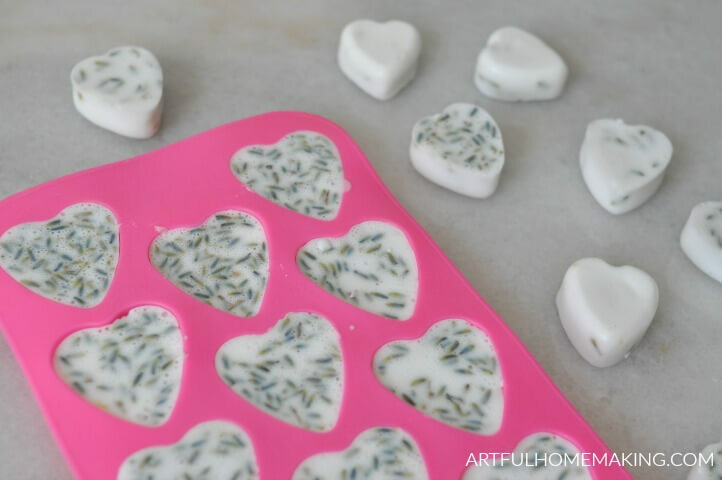 Lavender goat milk soap hearts are an easy craft to make with just a few ingredients. Make your own soap in just minutes! Valentine’s Day is just around the corner, and these lavender goat milk soap hearts would make a simple and useful gift idea! In addition to being fast, they’re also made with skin-nourishing ingredients like goat’s milk and essential oils. I’ve been making soap for several years now, but it wasn’t until recently that I decided to try melt and pour soap. One of my daughters got a melt and pour soapmaking kit for Christmas, and we had fun making the soap together. And it was so easy! 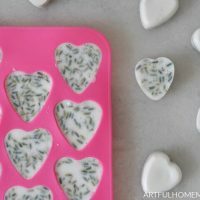 These lavender goat milk soap hearts use a melt and pour goat’s milk soap base, which is what makes the process so simple. Just melt the soap base, add any additives, like essential oils and colorants, and pour into a mold to harden. I decided to use some silicone heart molds that I’ve had for several years, just because Valentine’s Day is coming up. But you can use this method with any mold shape! 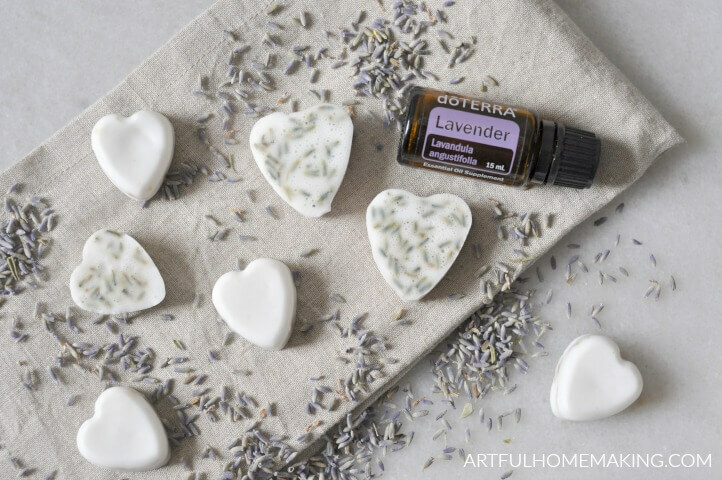 Here are the supplies you’ll need to make your own lavender goat milk soap hearts. A note on the heart molds. I used two silicone heart molds that I found at the dollar store several years ago. I think they were marketed as ice cube trays, but we’ve used them for everything from ice cubes to homemade chocolates, and now soaps! With 1 pound of soap base, I had a little soap left over in the bowl. Not a lot, but some. So, you may want to have an extra mold handy in case there are leftovers. First, if you have a 2 pound package of goat’s milk soap base, divide it in half so you’re only working with 1 pound for this recipe. Then, cut the 1 pound of soap base into squares. This helps the soap to melt faster. I just used a serrated kitchen knife to cut the soap base, and then put the cubes in a glass bowl like this. 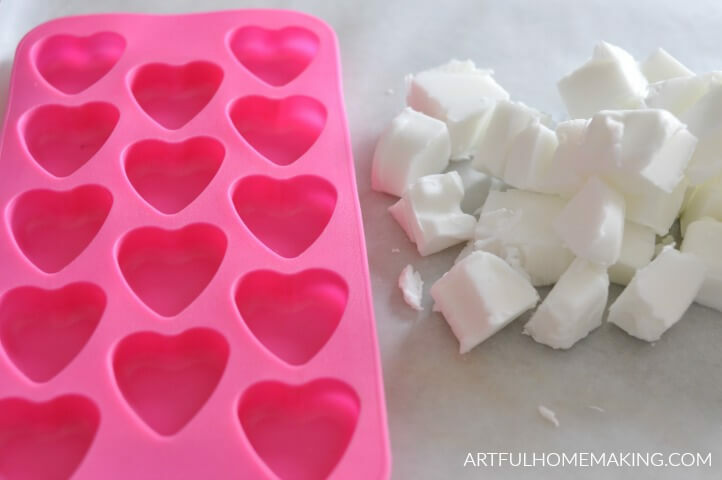 To make the lavender goat milk soap hearts, you’ll first need to melt the goat milk soap base. You can do this by either using a double boiler or the microwave. For the microwave method, melt the soap in 30 second intervals, stirring each time you stop the microwave. For the double boiler method, you can either use an actual double boiler, or you can create a double boiler effect by placing a heat-proof glass bowl in a pot of water on the stove. Cook on medium heat, stirring to help move the soap around in the bowl so it will melt evenly. After the soap has melted, remove it from the heat (or the microwave), and add in the lavender essential oil and the lavender flowers. Pour the soap mixture into the silicone molds and let harden. This can take anywhere from an hour or two, although the soap often starts to harden very quickly. After the soap has cooled and hardened, remove from the molds and it’s ready to use! 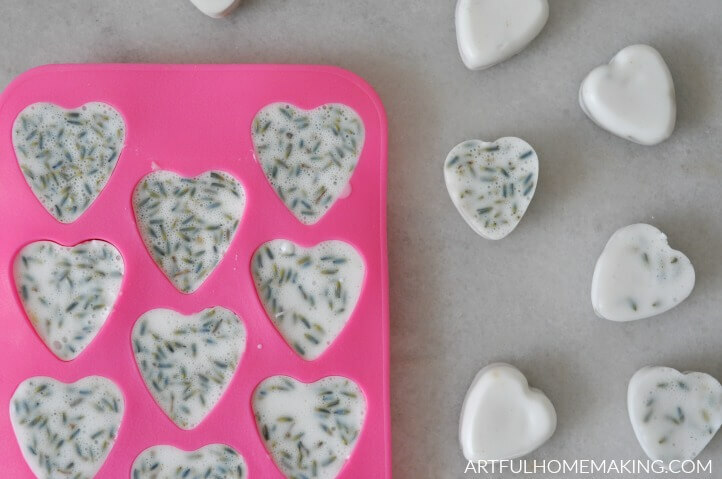 Lavender goat milk soap hearts are easy and quick to make! 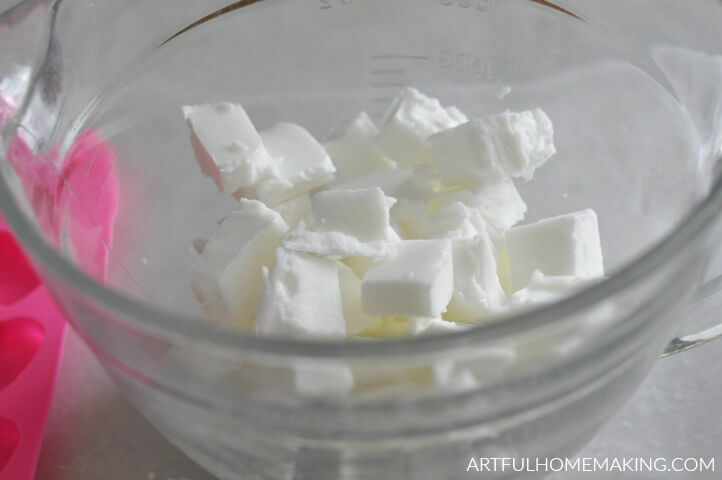 Cut the 1 pound of soap base into cubes to help it melt faster. Next, melt the goat milk soap base. You can do this by either using a double boiler or the microwave. For the microwave method, melt the soap in 30 second intervals, stirring each time you stop the microwave. For the double boiler method, you can either use an actual double boiler, or you can create a double boiler effect by placing a heat-proof glass bowl or a jar in a pot of water on the stove. Cook on medium heat, stirring to help move the soap around in the bowl so it will melt evenly. Cleanup: For easy cleanup, use recycled containers that you can save just for soap making projects. These are adorable and I love goat’s milk soap! Thanks for sharing on Homestead Blog Hop, we are featuring you this week! These are so pretty, and look easy to make as well! I’m wondering if it works the same subbing in peppermint essential oil and leaves too? Found you on the Homestead Blog Hop! Yes, you could use any scent or other additions you’d like! Thank you, Lesa! Have fun making them! making soap is one of those things I always wanted to do but never have. pinning this for later because you have a video and I need a video tutorial. Thanks for linking up with #OMHGWW and hope to see you next week. This is soap the easy way! Love this idea! Thanks for joining us for Friday Favorites. I’m featuring you this week. Can’t wait to try this! Thanks for sharing the recipe! Enjoy! They’re so fun and easy!